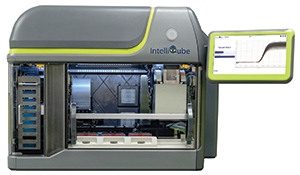 The IntelliQube® features a fully integrated automated PCR and qPCR setup, amplification and data analysis. The IntelliQube allows multi-functional dispensing for high speed fluid handling in 384- or 768-well Array Tape®. An interchangeable CyBi FeliX 96- or 384-channel pipetting head precisely dispenses DNA samples into Array Tape. IntelliQube has an integrated pipette wash system reducing tip waste and associated consumable costs while mitigating the risk of cross contamination. The IntelliQube integrated amplification is supported by a Peltier thermal cycling block. Temperature uniformity and accuracy enable broad compatibility with amplification methodologies. Multiplex data capture for all 5 optical channels can occur in as little as 10 seconds. Protocol generation and streamlined data analysis. Intellics is pre-loaded on an embedded Windows® operating system, accessible to users through a unified web-based interface. Intellics Array Builder™ allows users to rapidly generate liquid handling and thermal cycling protocols, and IntelliScore® for post-PCR data analysis and interpretation. IntelliScore supports absolute quantification (standard curve), relative quantification (relative standard curve and ΔΔCq), genotyping, and presence / absence. CSV data export for LIMS systems is possible. A touch screen interface facilitates instrument control and also supports real-time data monitoring.